OB-GYNs And ER Docs Miss Out On Medicaid Pay Hike : Shots - Health News The Affordable Care Act included a Medicaid pay hike for primary care doctors. It's an incentive for them to see the larger number of patients who will be covered by an expansion of Medicaid under the law. Some other specialists who say they also provide primary care won't be eligible for the increase. A medical assistant checks a patient's blood pressure at a community health center in Aurora, Colo. Metro Community Provider Network has received some 6,000 more Medicaid eligible patients since the health overhaul law was passed in 2010. Obstetricians, gynecologists and emergency room doctors will be shut out of the higher Medicaid pay that primary care doctors will start collecting in January. The Obama administration made the ruling late Thursday. Under the Affordable Care Act, Medicaid rates for primary care doctors will soon be on par with what Medicare pays. The overhaul law included the hike to encourage doctors to see the larger number of patients who will be covered by a Medicaid expansion. The OB-GYNs and ER doctors sought to be included after regulators released preliminary rules in May saying that internal medicine and pediatric subspecialists, such as pediatric cardiologists, would be eligible for the higher pay when providing primary care services. 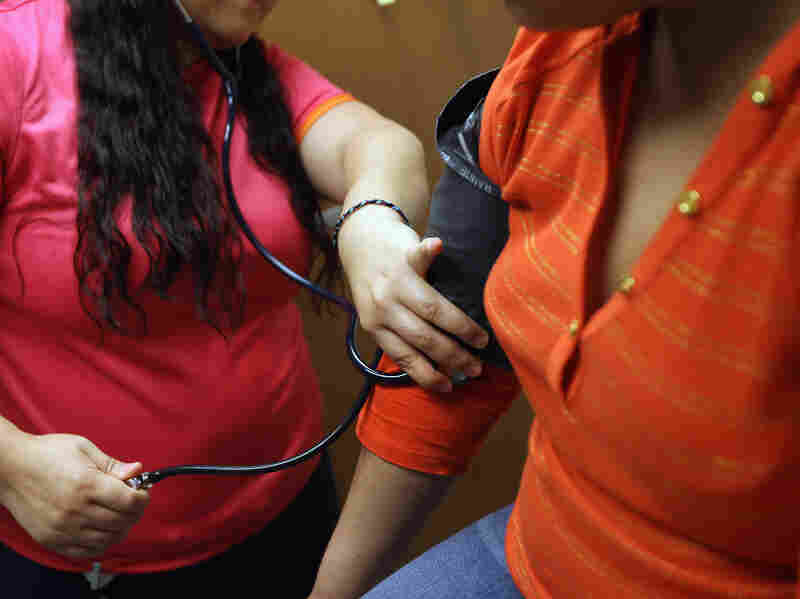 The increase is reserved for family doctors, internists and pediatricians, because those specialties are specifically listed in the 2010 law, the Centers for Medicare and Medicaid Services said. The decision against the other doctors came in the final regulations to implement the provision in the Affordable Care Act. While Medicaid pay to doctors varies by state, it generally falls far below below the rates paid by Medicare and private plans. The change, which will cost $11 billion and be funded by the federal government, means a 64 percent average pay increase, according to an Urban Institute analysis of the rates in 2010. Though the pay hike takes effect Jan. 1, it will likely be several months until many doctors see the higher reimbursements, because states have until March 31 to file paperwork with CMS to detail how they will pay out the money. The Obama administration is hoping the higher fees will entice more doctors to treat Medicaid patients. But the hike is temporary, and is set to last only through 2014. That has lowered expectations about its ultimate effect. Even so, American Academy of Family Physicians President Jeffrey Cain said in a statement that the final rule bringing Medicaid payments even with Medicare for primary care "is a step in the right direction." But Cain added, "Unless Congress acts to permanently extend and fund this provision, a sudden return to disparate and inadequate payment for primary care services needed by Medicaid patients after only two years will again threaten to restrict their access to such needed services." States have done little to promote the higher pay until now, in the absence of final rules and due to the uncertainty about the health law's fate after the presidential election. The final regulation removed a requirement for states to verify that doctors are board certified in family medicine, internal medicine or pediatrics before making the bonus payments. Instead, doctors will only have to "self-attest" that they are in one of the eligible specialties to get the higher pay. The final regulation also clarified that nurse practitioners and physician assistants would be eligible for the higher Medicaid pay, but only when they are working under the supervision of a physician in one of the eligible specialties.